Onyx is a premium brand of high energy water sports products that fuels your passion for on-water adventure and provides you with a safe and trusted water sports experience. 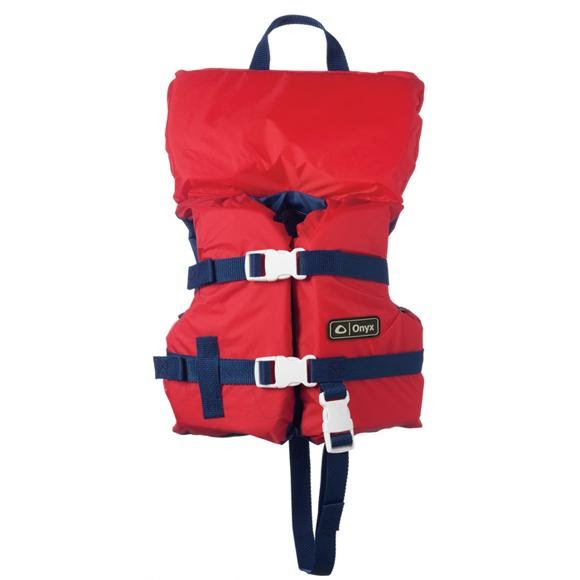 U.S. Coast Guard Regulations require you to have U.S. Coast Guard approved PFDs on your recreational boat. How many and what kind of PFDs you need depends on the number of people onboard, the size of your boat and the kind of boating you will be doing. Personal floatation devices are classified by location of use. Choose the right PFD for the location and type of boating you plan to do. Type I is for offshore operations. Type II is for boating near shore. Type III is a buoyancy aide to be used where rescue situations may be imminent. Type IV is to be thrown to an individual needing immediate assistance. Type V is a specialty PFD for specific activities or consumers. It&apos;s recommended that children always wear a Type II PFD or higher, even for onshore activities. Measurements adjustable, chest sizes 16-20"